From Ballet to Urban Dance! 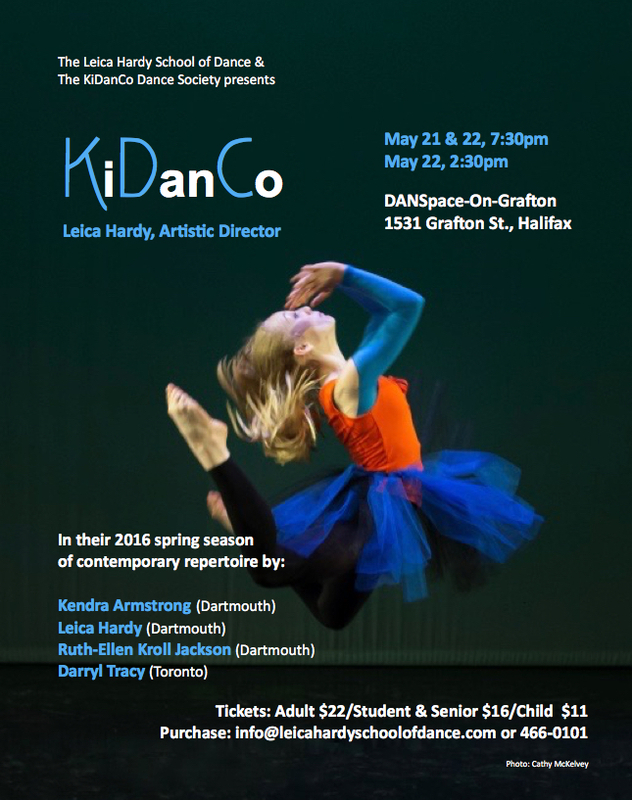 PURCHASE IN ADVANCE: Contact info@leicahardyschoolofdance.com phone 902-466-0101. Payment by cash, cheques to the KiDanCo Dance Society or E-transfer. PURCHASE AT THE DOOR: Tickets at the door are cash only. 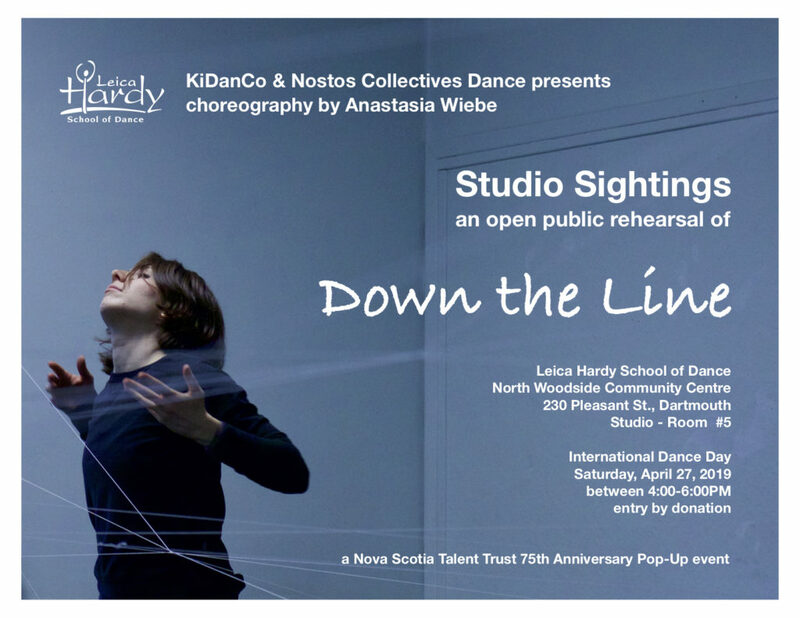 KiDanCo will present the works of Kendra Armstrong, Ruth-Ellen Kroll Jackson, Darryl Tracy, Anastasia Wiebe and Artistic Director, Leica Hardy in this engaging program of original works on May 12 & 13, 2018. The company’s twelve pre-professional dancers will perform a diverse collection of pieces from the classically balletic, to jazz, and contemporary work with elements of urban dance and improvisation. Kendra Armstrong’sRetractionis a mix of cool understatement and jazz styled introspection and will be performed to the live vocal Natasha Lefortsinging I Want You Back.To Pulsate by Ruth-Ellen Kroll Jackson is an athletic, fast-paced piece with urban vibe for six dancers to the music of Frank Bretschneider. KiDanCo alumna, Anastasia Wiebe, has createdPenumbrafor seven dancers. It is contemporary mix of structured improvisations and fast-paced movements with strong street dance overtones. Darryl C. Tracy’sA Tale of Obscure Sorrowsdraws its inspiration from John Koenig’s Dictionary of Obscure Sorrowsand movement games of chance. The end result is an abstract landscape for the full company that is sometimes intellectual, sometimes humorous, but always quirky. Upstreamby Leica Hardyis an excerpt from Waterwaysthat embodies the movements of water, fish and sea life become an abstract allegory for an emotional journey performed by soloist Denver Scott. Hardy’s second work in the program,Dvořák Serenades is a lyrically beautiful balletic work that captures the delicacy and fluidity of Dvořák’s breathtaking composition. 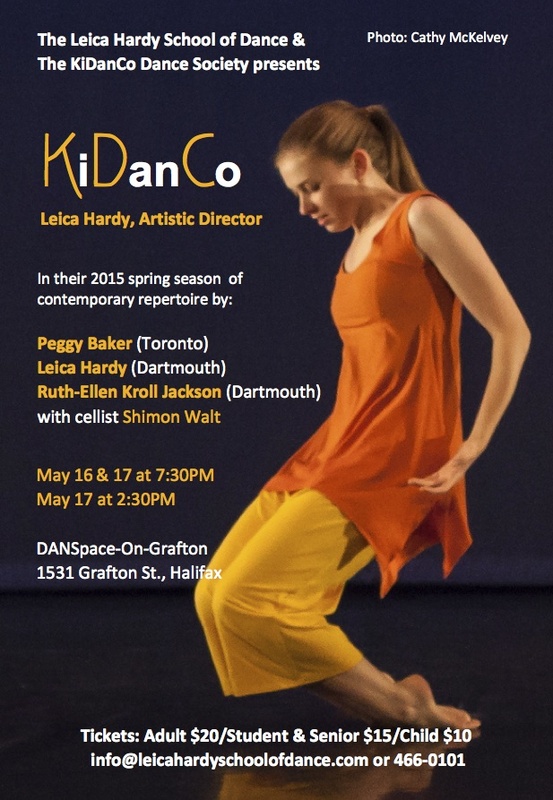 KiDanCo is honoured to present the works of Ruth-Ellen Kroll Jackson, Sarah Murphy, Lydia Zimmer and Artistic Director, Leica Hardy in this dynamic program of original works. This season many of the works embrace innovative trends in choreography and creative processes by incorporating improvisation in their creative development, and in performance. Two works by Ruth-Ellen Kroll Jackson will be performed in the program. Epiphanot (a non-epiphany) set to arrangements of original Jewish music by Lara St. John and Matt Herskowitz, is an absurd, comedic piece that challenges the performance skills of the dancers. To Pulsate is an athletic, fast-paced piece with urban vibe for six dancers to the music of Frank Bretschneider. Ruth-Ellen earned her Bachelor of Fine Arts in Dance from the North Carolina School of the Arts. Her performing career took her to New York where she danced with such companies as The Marth Graham Dance Ensemble and the Parsons Dance Company. She continues to work in the region as a choreographer, performer and instructor. Halifax born choreographer Sarah Murphy was accepted into the North Carolina School of the Performing Arts modern dance division at age 15. She went on to receive a BFA from the Juilliard School where she won a Princess Grace Award. She then danced for Canada’s Sylvain Emard Danse, and the world renown Netherlands Dance Theater II, where she performed works by Jiri Kylian, Ohad Naharin, Hans Van Manen, Alexander Ekman, and Lightfoot/Leon among others. Sarah’s month-long residency at the Leica Hardy School of Dance this past January culminated with the creation of Playground set to the music of Bach and Thom Yorke. The full-company work is a skillful mix of structured improvisation and stylish choreography with a European feel. Lydia Zimmer created Moonlight for the company’s six apprentices to the atmospheric Path 5 by Max Richter. Solos created by the dancers intermingle with thematic choreography, resulting in a dream-scape full of emotion and physical texture. 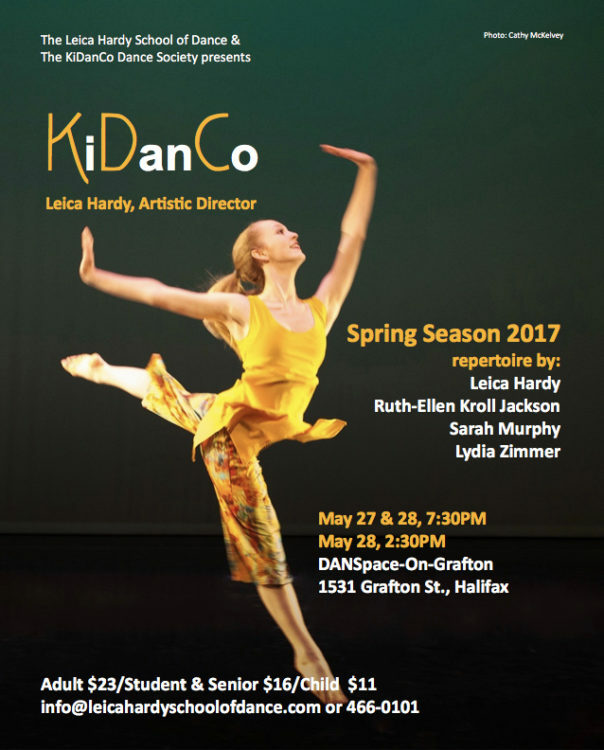 Lydia graduated from the Intensive Training Program at Halifax Dance, and then went on to receive a BFA from The Boston Conservatory. She then performed in Los Angeles with the California Dance Theatre, Julie Bour and in her own works. Her choreography has been performed in NYC at the White Box Arts Center, in Iceland at an artistic residency, as part of the Live Art Dance 2016 season, and will be seen in Europe this summer. The final work of the evening is Waterways by Artistic Director, Leica Hardy. This one-act work is choreographed to six pieces by composer Ludovico Einaudi. The movements of water, fish and sea life become an abstract allegory for the emotional journeys of the company’s 12 dancers. The work is a balance of strictly choreographed work, thematic movements developed from guided improvisations, and improvisational performances. Leica Hardy’s enjoyment of dance and movement has been a lifetime activity with over 40 years of teaching, performing, choreographic and directorial experience. Local audiences know her best as the director/choreographer of Symphony Nova Scotia’s beloved annual presentation of The Nutcracker, which celebrated its 26th season this past December. Leica is an examiner with the Society of Russian Ballet and was awarded an Honorary Doctorate of Fine Arts from St. Mary’s University in May of 2011. TICKET PRICES: $22 for adults, $16 for students (12+) and seniors (65+), and $11 for children. 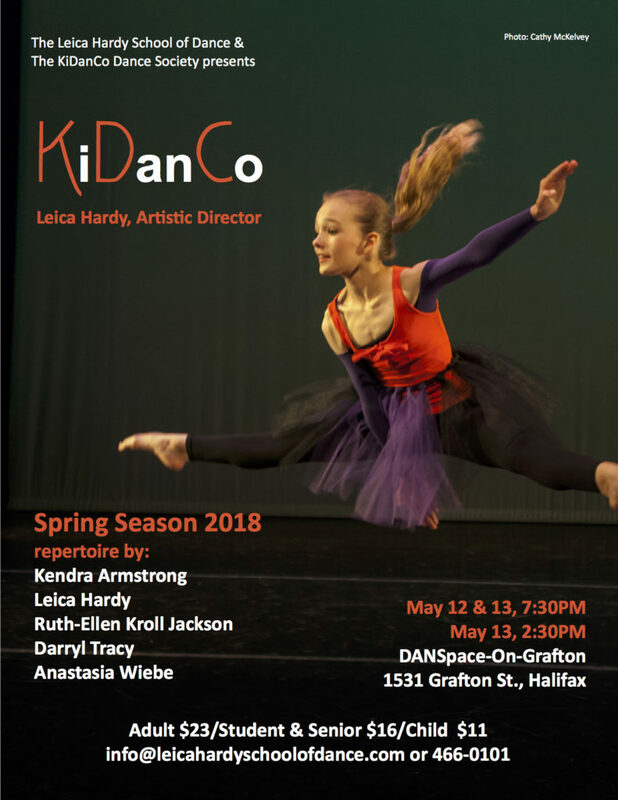 KiDanCo presents the works of Kendra Armstrong, Ruth-Ellen Kroll Jackson, Darryl Tracy and Artistic Director, Leica Hardy in this dynamic program of original works. Kendra Armstrong returns to the local dance scene after living in Alberta for the last few years. Kendra is has her teaching certification from the British Association of Teacher’s of Dance and studied with many of Canada’s great jazz dance legends at Decidedly Jazz Danceworks in Calgary. Her work Parenthesis is a playful romp of jazz dance styles for four dancers. Five dancers will appear in the premiere of Epiphanot (a non-epiphany) by Ruth-Ellen Kroll Jackson performed to arrangements of original Jewish music by Lara St. John and Matt Herskowitz. One Needs A Little Courage To Live explores the themes of risk-taking, persistence and courage. Ruth-Ellen earned her Bachelor of Fine Arts in Dance from the North Carolina School of the Arts. Her performing career took her to New York where she danced with such companies as The Martha Graham Dance Ensemble and the Parsons Dance Company. She continues to work in the region as a choreographer, performer and instructor. Chiralities by Darryl Tracy was created in 2013 with KiDanCo company members to music by Robert Henke. The post-modern structure and appearance of the work is contrasted by the playful setting – a floor filled with more than 100 balloons! Darryl is a Toronto dance artist, has created over 32 works and is a senior faculty member at the School of the Toronto Dance Theatre. 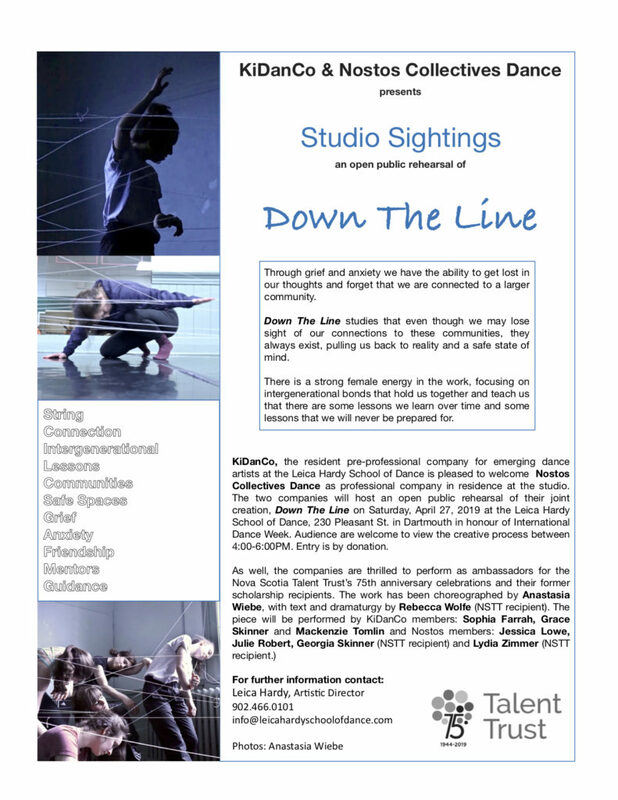 The company will also present two works by Artistic Director, Leica Hardy. Circlesong to music with the same name by Bobby McFerrin is solo for Lucie Schmidt that celebrates feminine strength and power. This is Lucie’s final year with the company, as she enters the Professional Training Program at The School of The Toronto Dance Theatre this coming fall. Her second work, titled Interlaced, is a modern dance cèilidh to the joyful music of Canadian band, The Fretless. Patterns and movement themes from square and Scottish social dance and Celtic knot-work give the work a feeling of community and sharing. Ticket Prices: $20 for adults, $15 for students (12+) and seniors (65+), and $10 for children. 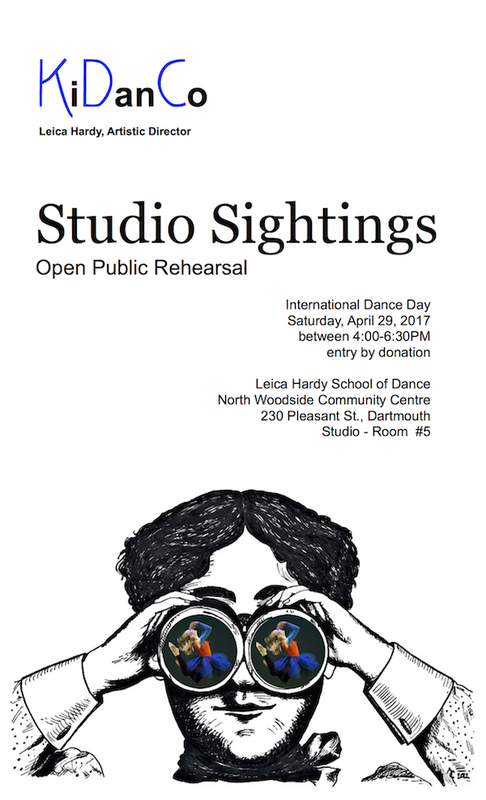 Purchase in Advance: Contact info@leicahardyschoolofdance.com or phone 466-0101. Payment by cash, cheques to the KiDanCo Dance Society or E-transfer. Peggy Baker is known for her outstanding contribution to Canadian dance, having received both The Order of Canada and The Governor General’s Award for Lifetime Artistic Achievement. Created in 2000, her work Unfold was originally created as a self-portrait of Baker’s life and career to date. Ms. Baker has created a unique group staging of Unfold that elicits a personal connection to the choreography from each of the five cast members. One Needs A Little Courage To Live by Ruth-Ellen Kroll Jackson is a vehicle for five performers, which explores the themes of risk-taking, persistence and courage. Ruth-Ellen earned her Bachelor of Fine Arts in Dance from the North Carolina School of the Arts and went on to perform in New York with such companies as The Martha Graham Dance Ensemble and the Parsons Dance Company. Opening the program is Leica Hardy’s Bach Unaccompanied, a three-movement work to selections from Bach’s Unaccompanied Cello Suite No. 1. The choreography is a contemporary look at the emotional undertones and rhythmic playfulness of the composition. Her second work, titled Interlaced, is a modern dance cèilidh to the joyful music of Canadian band, The Fretless. Patterns and movement themes from square and Scottish social dance and Celtic knot-work give the work a feeling of community and sharing.